The Chaplet of Guadalupe has a cross, 21 beads and a medal. Between the cross and the medal, there 1 bead, a set of 4 beads and then another bead. Elsewhere on the Chaplet, there are 4 sets of 3 beads, each separated by 1 bead (total of 3). protect the sovereign Pontiff, help all those who invoke you in their necessities, and since you are the ever Virgin Mary and Mother of the true God, obtain for us from your most Holy Son the grace of keeping our faith, of sweet hope in the midst of the bitterness of life, of burning charity, and the precious gift of final perseverance." On the first bead, pray 1 "Our Father...". Pray 4 "Hail Marys..." on the set of 4 beads in honor of Our Lady of Guadalupe's 4 apparitions to Blessed Juan Diego. Each set of 3 beads represents on apparition. Our Lady of Guadalupe appears to Blessed Juan Diego. Our Lady requests a temple in her honor. your compassion, your aid and your protection for all who would love you, trust you, and invoke your help." Pray 3 "Hail Marys..." followed by 1 "Glory Be...". Our Lady of Guadalupe gives Blessed Juan Diego encouragement after his return from the Bishop’s house. and encouragement you gave to Blessed Juan Diego to make a second appeal to the Bishop." Our Lady of Guadalupe promises a sign to Blessed Juan Diego for the Bishop. "Mother, I thank you for your third apparition to Blessed Juan Diego when, after this unsuccessful attempt to have a temple built, you said to him, 'So be it, son. Return tomorrow in order that you may secure for the Bishop, the sign for which he has asked.When this is in your possession, he will believe you; he will no longer doubt your world and suspect your good faith. Be assured that I shall reward you for all that you have undergone.'" 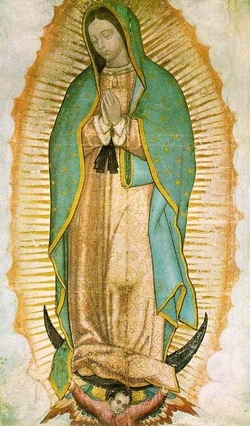 Our Lady of Guadalupe fulfills her promise by showing herself on the tilma of Blessed Juan Diego. printed on the tilma which appeared when the roses were released. thou didst promise to show thy compassion and pity towards all who, loving and trusting thee, seek thy help and call upon thee in their necessities and afflictions; also to hearken to our supplications, to dry our tears and to give us consolation and relief. Inspired with this confidence we come before thy august presence, certain that thou wilt deign to fulfill thy merciful promises. We are full of hope that, standing beneath thy protection nothing will trouble or afflict us. Thou has desired to remain with us through thy admirable image, thou who art our Mother, our health and our life. hear our petitions and in thy mercy answer us. Our Lady of Guadalupe, my mother, into your hands joined in prayer, take my prayers, petitions and hopes, and present them to Jesus for me. even though they are from me.